Most girl’s lacrosse sticks are built to last, which is an important aspect when purchasing a new stick. But all too often many youth players grow up playing with one stick and aren’t aware of when to make the switch to a more advanced stick. For a beginner, picking a stick based on fit and color works just fine. As your skill and talent progresses though, purchasing a stick that will allow you to handle the ball with precision is essential. Youth players should have input when their first stick is purchased for them. 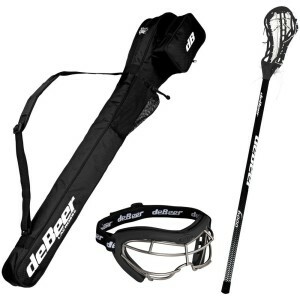 Many beginner sticks are bought simply because they are cheap or they come in a bundle with a stick bag, mouth guard and goggles for a set price that is a reasonable starter package for a youth player. A beginner stick will have a wider scoop and less offset in the head, making it easier to learn to cradle the ball and scoop from the ground, two things that youth players spend a lot of time doing. While most beginner sticks are not regulation length for the girl’s high school game, a comfortable fit and length for the player is important in developing skill and confidence. Unfortunately, not many parents or players realize how negatively affected a player’s skill can be by playing with a stick that is not advanced enough for the player. As players grow taller, gain athleticism, and use their stick for more than carrying the ball, the need for a player-specific stick develops. 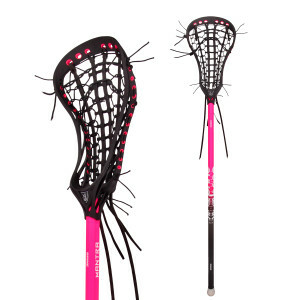 Whether it’s an offset head for an attacker to get more velocity on her shot, or a rounded scoop for a defender to more easily knock down passes and scoop loose balls, there are a variety of sticks made for specific needs. Is the player’s stick too short if the player has grown? In order to meet US Lacrosse rules and regulations, girl’s lacrosse rules specify that the girl’s lacrosse stick must be between 90 and 110cm. The shorter the stick, the farther a player must reach down to scoop a ground ball. On defense, a longer stick is preferred over a shorter one, as you can knock down more passes, cover a wider area on the field, and mark up opponents a little tighter. Is the head of the stick wider and more oval shaped? If so, begin to look for a stick that is more triangular in shape, wider at the top for maximum catching area, but channeled in towards the middle and bottom for ultimate ball control. Beginner sticks are wider and more oval shaped to allow for youth players to develop the catching skill. Advanced heads are offset, featuring a drop in the sidewall of the stick allowing the ball to sit inside the pocket, rather than on top. Is the stringing mostly leather? Beginner sticks might have 4-5 leather strings running vertically in the pocket. More advanced sticks have a streamlined pocket made of 2-3 thick strings made of plastic, nylon, or a dense foam hexagon pattern in the center and webbed stringing at the sidewall. The narrower channeled pocket allows for more ball control while cradling and when checked, and higher velocity shots as well. The most important point to take away from looking into buying a new stick is to make sure the player feels comfortable using it. A more advanced stick in the hands of a beginner isn’t advised because the important skills like catching and ground balls won’t be focused on if the stick is designed for the more advanced player. Developing a player is just as important as the decision to buy a new stick. The right stick can help advance the total player, whereas an incorrect stick can impair the developing player! About the writer: Sean Nelson runs Lacrosse Scoop and Field Hockey Review, two websites dedicated to providing players with helpful resources for their respective sports. This entry was posted	on Monday, August 31st, 2015 at 9:46 pm	and is filed under General, Parents, Players. You can follow any responses to this entry through the RSS 2.0 feed. You can leave a response, or trackback from your own site.